Over the past few years, outdoor garden structures—places that offer shade and alternative destinations in a thoughtful landscape—have become more popular. These structures are often called by a variety of names—pergolas, trellises, or arbors—and the terms are often used interchangeably. But one thing is consistent no matter what you call them—pergolas are useful and add depth and texture to your outdoor rooms by providing two key benefits—structure and shade. When we think of gardens, we often think of rambling natural spaces. Though this can be one type of garden, often properties don’t have enough space to create a vision of boundless nature. In addition, it’s growing more common to use a garden space as a place to live in and enjoy rather than just a scene to observe. Pergolas can further the use of outdoor spaces by providing a presence and an architectural form in the garden. You may have heard the phrase “If you build it, they will come,” from the movie Field of Dreams—at BYLA, we couldn’t agree more. By creating a visible and architectural destination in the garden, you invite use and gathering at that spot. The creation of strong architectural forms within a garden space calls attention to it and offers more than a hint of hospitality and welcome. BEFORE YOU DESIGN YOUR PERGOLA, CONSIDER THE ARCHITECTURE OF THE OTHER STRUCTURES SURROUNDING IT. A SEAMLESS LOOK CAN BE CREATED IF THE STYLES OF THE SURROUNDING BUILDINGS ON THE PROPERTY CAN BE INTEGRATED. 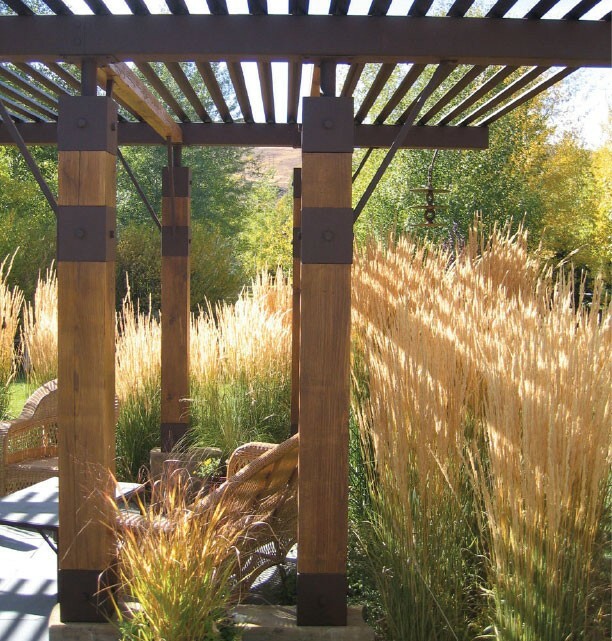 The attention a pergola draws to a garden can also lead focus to other parts of the landscape as well. The orientation and nature of the structure can be used to spotlight views, near and distant. For example, a square pergola will draw attention equally to all sides. A rectangular pergola will draw attention to either the far narrow end or the near long side, depending on its orientation, the approach, and the rest of the garden space. If you want to highlight a distant view, it is possible to accent that view by framing it within the structure. Because the architectural elements of the pergola will guide our perception, viewers will focus on the distant view automatically. The challenge is to ensure the right alignment and orientation before the start of construction. KEY PLANNING NOTES: Know what you want to get out of your pergola—shade, views, or both? Consider matching adjacent architectural style. Remember to consider the angle of the sun. Remember to provide waterproofing if needed. Building codes and structural integrity are important. Think through your furniture layout early if necessary. Lately we are finding that many homeowners are removing large aspen and spruce trees that have begun crowding out the landscape over time. These mature trees hog space and light, but often when removed, there is a disjointing void and a concerning lack of shade. Enter the pergola. 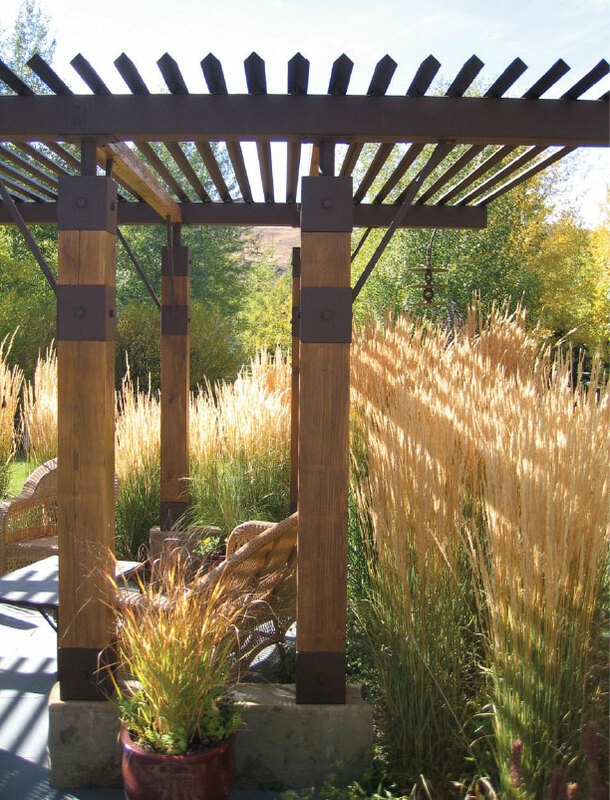 The biggest mistake that is often made when creating a pergola for shade is that one forgets that it takes more than a few beams of wood to provide useful shade. There are many ways to create shade—in the most traditional sense, vines can be grown up and around a pergola to block direct sunlight. Due to our mountain climate and short summers, vines are not as viable as in more verdant climates so many clients opt for shade cloth and overlapping structures. The key thing to remember when planning your shade is to note the angle of the sun during various times of day, especially those times of day you plan to use your pergola with frequency. This does not need to be an astronomy lesson, but a little planning goes a long way. If, for example, you want to enjoy a picnic table at lunch, then it’s safe to assume that the sun during high summer may be more or less overhead. But, one trick of the trade is to know that even at midday, the sun will always be at an angle to where you stand. For this reason, useful pergolas are often larger than one might expect. If your primary use is for relaxing and enjoying some late afternoon and early evening cocktails (like many pergolas are here in Sun Valley), the sun may be very low—so low that the angle of the sun may pass right under the pergola! When it’s too hot out, no space is a great space, so be sure to augment the structure with vertical drop blinds or adjacent vegetation should you want late-day shade. This will allow you to adjust the shade needs for the time of day. A pergola should be a great long-term investment in your outdoor space. To that end, the care and finish detailing need to reflect the realities of the weather. Wood beams should be sized so that they can carry the load of the snow. It is a misconception that snow will fall through a pergola—more often, snow will build up and bridge between supporting and shading members; the structure must be able to handle snow loading. Wood beams should be flashed with metal or waterproofed. Metal elements can rust and stain adjacent patios; painting and sealing can help negate that. Most jurisdictions, common sense, and local building codes would suggest and require an engineer to sort out the details of what kind of supports and spans can be appropriate given the visual style and location of your pergola.